It is early morning, The Healer a tall woman with the short-cropped, knotted hair of her people. I lean closer to hear her words, those bloodshot eyes blurred but vacant. She talks of `home’ – and the importance of family – before suddenly falling silent. We’re standing on an elevated ancient seabed: the rocky ridge of Johannesburg’s Melville Koppies; at our backs the distant towers of Jo’burg proper. The temperature drops, across the way the rolling urban hills of Sophiatown: these days neat, quiet houses and gardens, tarred roads and pale rendered walls, first surveyed in 1903, an urban experiment with black Africans owning property and living among other races. 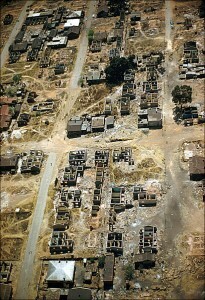 With the distance from Johannesburg and a sewage plant built nearby, most whites had left by 1920. By the late 40s, Sophiatown included 54000 Black Africans, 3000 Coloureds, 1500 Indians and almost 700 Chinese; the violence, jazz, poverty and politics, all home to writers and artists, but far too close to circling white suburbs. With a National Party election victory in 1948 – and the Immorality Amendment Act of 1950 – mixed races would no longer be allowed to live together. The Healer sniffs, then coughs. A morning breeze chills my face as I rub my hands and stuff them deep in down jacket pockets. She lifts those bloodshot eyes, her breath already beery. She talks of a terrified five year old – the year 1955 – arms wrapped tightly around a mother’s knees. There’s no tomorrow; the pre-dawn icy cold, the nightdress flowery but thin, cold rain on bare arms. The Healer sighs, looks up and shivers; the little girl is sick with German measles. 2000 police roam Sophiatown, guns, rifles and whips in hand. Straining dogs on taught leashes snap and growl, gunshots crack; family furniture tipped in the back of police trucks, driven south 35km and dumped. The human relocation to Soweto follows, the fractured families dazed and silent. I gaze southward to the distant desolate profile of a gold tailings dump. Over the next eight years Sophiatown is bulldozed, flattened and obliterated from South African maps. Late afternoon I’m alone – standing on a Soweto mound – at the base of a circular tower in the centre of a park; the surrounding gardens a breath of fresh air, the tower built from cast blocks from the ashes of Sophiatown, a dark rough grey, smudging the sleeve of my jacket. I’m struck by the quiet. The iron-barred gate is narrow, squeaks and opens with a stiff push. I head up a flight of winding uneven steps. At the top I blink, the sky a washed blue, then turn to peer over the wall and get my bearings, momentarily mesmerised by the crow of a rooster and the rows of houses stretching towards the horizon. Along gravel footpaths by traffic-choked streets, I pass fruit, trinket and sweet stalls; friends ambling in fits and starts, a frail old woman balancing a bulging green bag on her head while Friday groups of youths lean on parked cars and swig from brown bottles of beer. Packed minibus taxis prop at corner pick-ups and awkward angles, to fit in one more fare. I slide open the door with a loud bang, scramble up the back – a lone white face – swapping greetings with Soweto folk and squeezing between a nurse and a doctor; my fare relayed by willing hands to the Zulu driver up front, my change returned the same way. I’m met at the gate by The Healer; gazing down the end of the road at the daunting vision of the mine tailings dump looming close by and skyward, aglow in the orange and red of a dying sun, but loaded with lingering traces of arsenic once used for the extraction of gold. The Healer lives in a room out back, this rambling house home for an extended family of twelve. She smiles wanly after a meal of pap and gravy: the local polenta staple of corn maize. I’m a guest, she says, as she wipes her mouth, her bed mine for the night. For a moment I stand peering through the 600mm cell-like window, through pretty lace curtains. Reaching for my pack, my once black shoes are all dust. I tug at the bolt, push the door, step up and inside. There’s the faint smell of lavender. The Healer’s room is small; narrow bed pushed against one wall, the window directly above, the floorspace all of two metres square. A brightly coloured quilt lay neatly folded, a small wreath circle of dried mountain sage neatly sitting on top; the pillow at the far end, frilly pastels of pink and blue. There’s no room to move; the box fridge, microwave and polished ply bench all in the compact alcove of a built-in wardrobe. A vase of freshly gathered flowers sits on the bench; a small framed picture of a young schoolgirl, staring up at a woman in a 1950s bonnet, tall and straight in her Sunday best. By the photo there’s a small glass orb on a plastic base; a cottage inside, a layer of snow on the steep gable roof. I sleep on the floor, tucked between the fridge and bed. The night’s freezing; there’s no insulation here. I cross thermal-clad arms, woollen beanie pulled on tight, down jacket thrown across cold knees. The Healer has a sister and three brothers. The sister has a daughter named Marcia: a sweet nineteen year old with an infectious giggle and a shining round face. I ask of The Healer and Marcia drops her eyes. It seems The Healer is special: the neighbourhood’s conduit to ancestors and full-time carer for a bedridden mother; washing, talking, changing bedding and bedclothes, the old lady’s face gaunt and grey, the smile warm but weak. Of the brothers, one runs the beer-house out front – the local shebeen – the single room bare except for a squarish table with a plastic top, a bench seat and two rough-carved chairs. He sleeps next door, by a beer fridge that rattles and hums day and night. I drink outside, in a small paved yard among neighbours and passers-by. The Healer stands in the shadow of a wall just watching, quietly coughs and demolishes a pack of cigarettes, until finally emerging and drawing close. All banter stops, The Healer saying nothing at first; just looks me up and down and refusing to leave my side. I feel all eyes on this woman, some wary – some in awe – whispers and nods as if all but me understand. In the morning things are slow and I’m leaving, but am suddenly swept up in the arms of The Healer. Her talk is excited and scattered, slurred words I just can’t catch. I look around for help, young Marcia gripping my elbow and nodding. “She is saying you must visit your mother.” Marcia’s voice is hushed. “She is telling you it is time.” Those bloodshot eyes are wide, The Healer nodding her head until finally releasing her grip. I’m followed to the kitchen where I buy The Healer a morning bottle of beer; Marcia’s mother – The Healer’s sister – stands at the stove, solid churchgoing stock, scowls and raises her eyebrows. The money is snatched from my hand and tucked in a jam tin by the fridge. “You must not be taking notice of such talk,” she grumbles. The Healer refuses to let me leave without promising to ring. Back at my apartment, my pack lay open on a waist-high bench, me pulling out empty chocolate wrappers and a sweat-stained shirt. I’m about to email `home’, the whisky bottle half empty – visits to far-off Melbourne less frequent these days. There’s a tap on the tiled floor: a torn-off piece of beer-carton cardboard with a note scratched in a shaky hand. Bending down, I screw up my eyes; the name and phone number almost unreadable. I see The Healer, concern written on a pock-scarred face. I must go to my mother, she’d said: a mother who stepped out in front of a car to be instantly killed some forty years ago; me having never visited the grave. Ian, first of all, I was very moved by The Healer insisting it’s time for you to visit your mother’s grave. That your mother was killed stepping in front of a car some 40 years ago is very sad and tragic. I am so sorry, I didn’t know. Your post is very poignant on many levels. I learned so much more from reading this than I had known about these cities. From your richly descriptive writing, I could see The Healer’s bloodshot eyes, “the nightdress flowery but thin,” her pock-scarred face. Human relocation, “fractured families dazed and silent,” so terrible and upsetting. I could also sense The Healer’s warmth and generosity, the reverence others have for her, and her deep sorrow for what had been and what was now. Excellent photos too. Very kind JL. Thank you. We can hope that history never repeats itself, but seem often disappointed. That last paragraph gave me chills, Ian, and I remember you telling me about your mom’s tragic death in one of our BC discussions. You really are an amazing storyteller. It really did strike me as odd @ the time… one of those moments. That was poignant in several different ways. Last paragraph especially.